Lompoc Brewing is hosting its annual Black Out Beer Fest on Friday, Feb. 21 from 4 to 11pm at Sidebar, 3901 N Williams Ave. 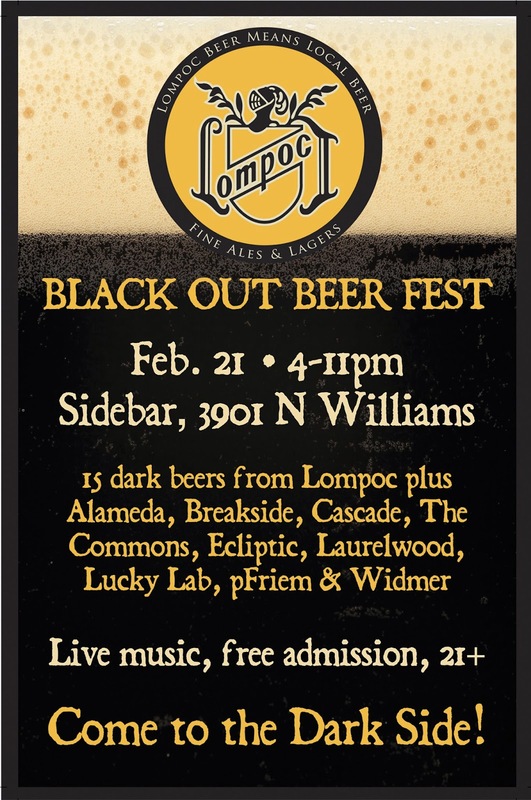 The Black Out Beer Fest will feature 6 dark beers from Lompoc and and feature more dark beers from special guests Alameda, Breakside, Cascade, The Commons, Ecliptic, Laurelwood, Lucky Lab, pFriem and Widmer. This event is free for all those 21 and older. However, tasting packages are required to drink the beers and cost $15, which includes a souvenir tasting mug and 10 beer tickets. Additional tickets can be purchased for $1 apiece. The standard beer/ticket exchange rate of one for a taste and 4 for a full glass apply. Mug and tickets can be purchased at Sidebar. The beers will be located in Sidebar, the brewery bar and the tented and heated parking lot. Live music will be provided by Leslie Lou and the Lowburners. You need to do this for all the beer events you go to and that are coming up. I didn't even know about the coffee one until you posted about it. Do my beer drinking legwork for me damn it. I'm too lazy to find the information for myself.